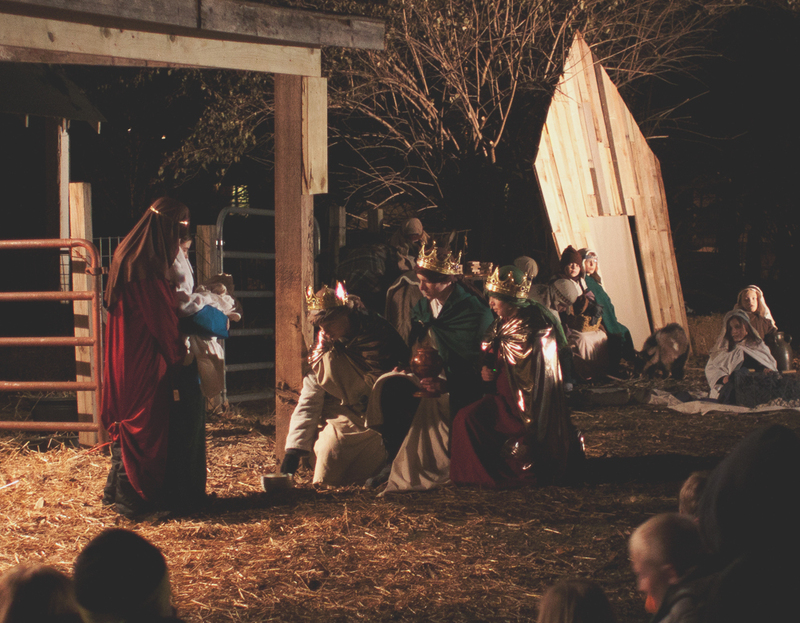 THE LIBERTY STAR FARM NATIVITY IS A FREE, LIVE NATIVITY PAGEANT FOR ALL AGES. NO TICKET IS NECESSARY, BUT WE ASK THAT YOU RESERVE YOUR SEATS SO WE CAN PLAN ACCORDINGLY. Yes, the nativity, animals and refreshments are located outside so you’ll want to dress warmly, including hats, scarves and gloves. You might even want to bring a blanket or hand warmers. If it has been a wet december due to rain or snow, it might also be a bit muddy. Be sure to wear shoes that would be fitting for the outdoors. Is the nativity handi-cap accessible? The nativity has a couple of handi-cap parking spots available. The nativity pageant is located on grounds on the farm that are grass. If you or a loved one is in a wheel chair or walker, you might want to test out their ability on grass before making a decision to come. Yes, the animals are friendly and children and adults alike are encouraged to pet them before and after the pageant at their own risk. A few of our animals are shy and might not enjoy petting. guests will be notified which animals need some quiet time. does the nativity ever get cancelled? Unfortunately, since the nativity pageant is outside, if there are severe weather conditions the pageant will be cancelled. Severe conditions include extremely low temperature and snow. Guest will be notified by the email addressed provided when you sign up. Why do you collect my email address? Will I get spammed? We collect your email address so we can notify you if the nativity gets cancelled due to inclement weather. Also, we will send you notification for future nativities. We will not sell your personal information, as we ourselves hate to get spammed. Can we take pictures or video of the performance? yes, you can take pictures and video of the performance, but we ask that you not use flash as it interferes with our child actors as well as our animals. We also ask that you not block aisles or other participants’ view. Yes, there will be a port-a-potty available for the public to use. Can I join the cast? Yes, although all casting decisions are made before Thanksgiving for the current year,you are welcome to inquire about roles available for the following year. No experience necessary. you Must be available to attend the practices, the dress rehearsal and the performances. Can I volunteer and get involved? We love volunteers. The entire production is made up of volunteers, from actors to parking to refreshments to production team to marketing. We’re proud of the fact that we are a community of christians coming together to celebrate Christmas. Send us a note with your willingness to help and any skills you might have. The nativity Pageant is a not-for-profit endeavor and each year many people donate time, money and supplies to making it great. If you or your business wants to donate financially or material resources, we would be grateful. We kindly thank our sponsors on our website, social media platforms and we occasionally will hang your printed signage if applicable. Learn more about becoming a sponsor.